#1: Thursday 26 April 2012 / 10:25:08 pm. 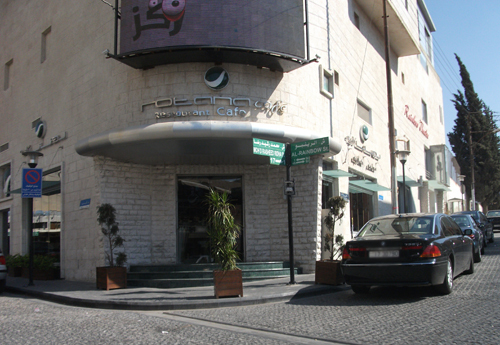 I am so sorry to tell you that Rotana Cafe Jordan is one of the worst cafe's I have been to, the service is very bad one waiter for one whole floor, thats one . We reserved on Thursday for Karaoke night and the Manager tells us that the machine is not working , Now is that how you handle your service, even if there where 3 tables or Two, our Table had 12 people who came to have fun (Karaoke), Eat good food ; which turned out to be very bad ; drink coffee which was also awful . 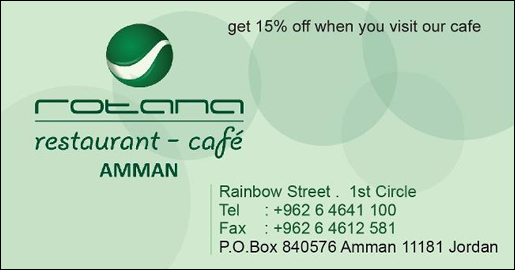 I am sorry to tell you but Rotana Cafe is losing its customers because of their Lousy Service and Lousy food and on a weekend having 3 or two tables only you wonder why??? and everyone who was there are saying they will never come back. It takes one mistake to ruin a whole place. #2: Saturday 28 April 2012 / 1:21:34 pm. The Rotana Cafe here in Jordan has the worse Service and food ever, I am so sorry to tell you that a wonderful place is ruined because of such service, reserving on Thursday for Karaoke and the Manager come along saying "Sorry the Karoke Machine is not working" because there was only 2 or three tables, well I think you know that this attitude will discourage people from ever coming again,two at least the food should be good, It wasn't ,very bad service. We where 20 people who decided NEVER to go there again because of the Service,Food and Treatment . Just thought you guys should know.